Tabitha’s Closet sprang from a desire to follow Jesus and be Good News in our community by providing clothes to those in need. Tabitha’s Closet offers “gently used” clothing to anyone in need at no cost. At this time we are able to provide children’s clothing for families. It is our prayerful vision is to be able to expand and offer clothing for people of all ages. 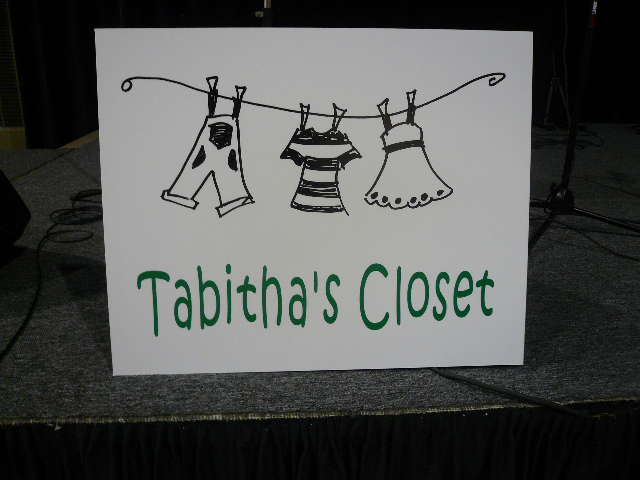 Tabitha’s Closet began in the spring of 2008 and, since that time, has been able to help hundreds families in need of children’s clothing. We have assisted orphans in India, earthquake victims in Chile, children in the Gwinnett School system, women facing crisis pregnancies, families in the Cornerstone church, and families in the city of Duluth. We are in need of volunteers to help us sort and size clothing on the Sunday following each consignment sale. If you would like to be on the volunteer list please contact us. If you are in need of children’s clothes or know of a family in need please fill out a Clothing Request Form (located in the church office) or you can set up an appointment to visit Tabitha’s with Karen Townsend or Betsy Gooch.